I recently saw a paper written by a fourth grader that was returned by her English teacher with more red ink than student handwriting. And, the teacher had literally re-written the entire student piece in red. There was a rather sarcastic, nasty comment to boot that went something like this: "Why would you even think the main character's return to the forest was so important?" The student received an "I," for incomplete. Under the classroom rules, she could re-write the paper and resubmit it, basically copying the teacher's red edits in her own handwriting to achieve a good grade. Can you see the smoke rising from my head? The assignment asked the students to write a paragraph long summary of a book they had read together as a class. To complete the task, the students had to be able to identify the key elements of the story and describe the book's essential themes. That's a quality assignment as it requires the students to process what they have read and then cull out the story's meaning. We hope students can do this with everything they read as they progress along the educational pipeline. The student paper I just described reveals - clearly - that the either student did not understand the assignment or, if she understood the assignment, she did not know how to do what was required. Or, the student's sense of what mattered in the story was different from the teacher's view; perhaps she really did not know what mattered. What the teacher did - in red - fails to address any of these options. Let's start with the use of red pen. 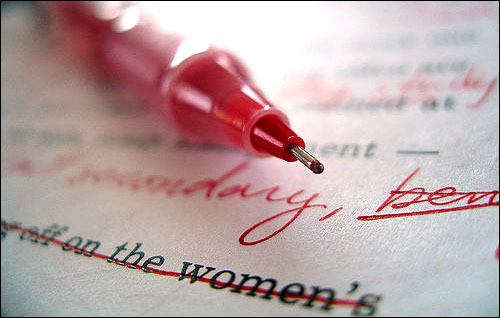 There is a rich literature both in the US and the UK suggesting that the use of the red pen has to stop. The color itself blinds students to the teacher's mark-up; the student literally sees red and nothing else. Also, as colors go, red is not a positive color. It signals danger (like a hot fire) and stop and negativity. Why use a color to correct a paper that is so loaded with negative thoughts? There is a reason for the expression "seeing red" to describe anger. Here's the point on color. All corrections are hard for students to receive, even when meant constructively. It is not easy to see that one's work has not met the bar and that the teacher has identified a myriad of flaws. Pick another color - green or blue or even purple. Why not let students choose the color they want for corrections? But, the flaws by the teacher extend way beyond color. Rewriting a student's work does not enable the student to do the task. Yes, I appreciate it took time for the teacher to do the rewriting. Rather than rewriting, the teacher could outline more clearly what the paragraph could look like in sentence one, sentence two etc. And, in this instance, the teacher should have met with the student to help her think about what ideas are important in the story and why. An added strategy would be to show all the students an example of a quality summary paragraph and then let them self-correct based on the model and ask them specifically to identify the difference between the quality model and what they wrote. Self-revelation has a way of sticking that copying does not. As to the nasty comment, also in red, there is nothing to say except that's bad. Come on. We want to encourage students; we want them to learn, not be embarrassed. And, why not ask the student why she thought the return to the forest was so important. Perhaps to her it was - for reasons that may not be evident on the surface. Moreover, I can picture a youngster relating differently from the teacher to the key elements of a story. The literature on combining positive with negative comments is abundant and clearly part of best practices across the educational pipeline. I can hear the voices of critics suggesting that I am being too soft, that students need to accept criticism and tough it out. I can hear folks saying things like: when I was a student, the teacher hit me with a ruler and ripped up papers. I can hear the claim that we are raising a generation that is coddled and pampered. To these criticisms, I would respond that the literature on learning and psychology do not support their observations. Learning involves risk and creating a safe environment for learning is the way to accomplish that goal. Positive comments, personal attention, non-red ink - these are just the beginning ways to create a climate of learning that is tied to enhancing student success, student self-belief and student progression through the educational pipeline. I was tempted to write the above last line in red - to make an ironic point. But, I will refrain. Positive role modeling is way better than the inverse. So should all teachers.